Enough with the scary “MAGA Hat” criminals already. 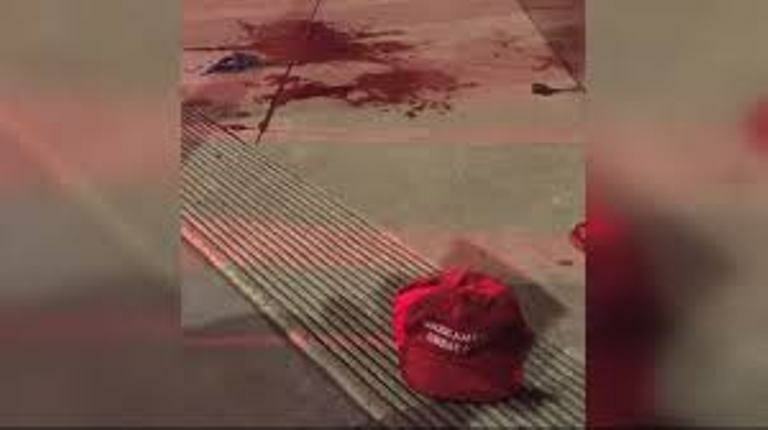 San Francisco Police are searching for a MAGA hat-wearing suspect who allegedly cut another man’s hand with a sword after an altercation in front of a roller rink on Friday at around 9:50 p.m.. Oh, and he conveniently left his MAGA hat all nice and tidy right by the pool of blood. Is that weird? Let’s put Jussie Smollett’s little routine away from a minute and assume this was a real incident. Hard to get his stunt out of our minds, but let’s try it. Well, we tried. Pretty hard to put that Smollett episode out of our minds, isn’t it? Investigators were searching for security video and speaking to witnesses Saturday as they tried to piece together the details of the bloody confrontation that unfolded during the rink’s Friday night adults-only roller disco. According to witnesses, the victim tried to grab the man’s MAGA hat. The man, who was supposedly “dressed like a pirate” whipped out a “two foot long sword” and sliced his hand and wrist, according to NBC Bay Area. The suspect also reportedly screamed “homophobic” slurs. Police initially said the victim was wearing the hat, but later changed their report. One witness stated that he saw the sword tucked into the man’s jacket about 30 minutes before the altercation. The victim was transported to the hospital with non-life-threatening injuries. He reportedly tried to chase the suspect before realizing how badly he was cut. The suspect fled the scene. Most people who wear MAGA hats are not sword-wielding assailants dressed as pirates, as much as liberals want to paint us all that way. And why leave the hat behind? Guess we’ll see after the investigation. Who did it? So you mean to tell me, that a MAGA hat just “happened” to fall perfectly on the ground like that for the picture at a crime scene? I don’t believe the headline, and the media only has itself to blame. There have been far too many ‘cry maga’ stories that have been shown to be false.